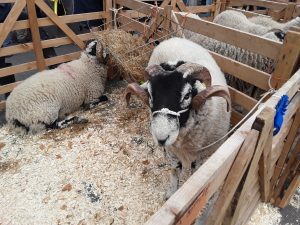 Last weekend i was at the Nidderdale Festival of Food, selling Swaledale Mutton as well as Dalesbred Hogget and Lamb from a friend’s farm in Bishopdale. I had intended to take some pictures to post here…but was far to busy and forgot! It was however a very good day, both enjoyable and rewarding. I sold a good amount of meat, lots and lots of people loved the samples of Mutton I had to try and i talked to a very large number of people. What is really nice is that several remembered me from last year and told me how much they had enjoyed the leg/shoulder/chops they bought then. This is one of the best bits about getting out there and selling the meat direct; finding out how much people enjoy the mutton. I also had lots and lots of people express an interest in attending a Sheep Handling course and others interested in getting a whole or half carcass at some point this winter. There was also one very fortuitous meeting with someone who has passed on contacts in London that are already looking very promising indeed…more on that at some future date. So, if you were at the food festival and came to talk to me, thank you for making it enjoyable for me and if you were not, you will have to try and get there next year. 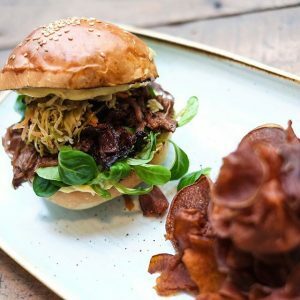 Author AdministratorPosted on November 5, 2018 Leave a comment on Food, glorious food!! As i wrote in my last post, i knew it would be a busy few weeks. Then i had confirmation that the second Nidderdale Food Festival is to be held on Saturday the 27th October in Pately Bridge. I need to order some new business cards, paper carrier bags and other sales paraphernalia. I have booked two more wethers in at the abattoir and have booked the butcher to cut them up. I will need a float of cash. need to sort out my card reader. So much to do, so little time! Author AdministratorPosted on October 14, 2018 Leave a comment on Even busier!! Luckily, the mild and damp weather means that the grass is still growing and so they won’t need much feeding yet. It also means that the tups and ewes should be in very good condition for tupping meaning i should get a good crop of lambs next year and good deadweights for the muttons this year. Deep breath whilst i can! What with one thing and another, i seemed to stop writing the blog posts for a while. However, things are changing all of the time and so i intend to write at least a post a week from now on when i can. Things are changing (for the better) here with the sheep. There is an exciting new opportunity on the horizon that should give me access to more land and more sheep, there is the opportunity to publicise my sheep handling courses more widely and the sheep themselves have done well this year, despite the dry summer. The autumn is also a busy time of year. There are the sheep to gather from the moorland fields and no doubt a few will have strayed and i will have some of other peoples strays in with mine. There are walls to repair and Tups to get ready. I am not sure if i am selling any breeding Ewe lambs this year, but if i do, there will be that to sort out. It has been a while since the last post, but that is one of the wierd thing about writing a farming blog. When there is a lot to do with the sheep and in the fields, there is a lot to write about and no time to write. When things calm down, you have time to write but nothing to write about! Anyway, it has been a very busy winter. The weather has been pretty good. We have had a few days with light snow, a few days with a hard frost, a bit of rain and some stormy days, but all in all not too bad at all. Last years lambs went off to some winter grazing near Thirsk, so they are out of the way and nearly forgotten. The mutton wethers have been a good size and have proved very popular, but more of that later. The tup got on with it and served most of the ewes in the first cycle, even though his bad leg is still not 100%. The ewes look healthy and in great shape considering it is January. And so far, i have only lost one sickly lamb all winter. That is not bad at all given the proclivity sheep have for dropping dead with no warning! So in amongst all of the feeding, foot checking and so forth, i have been taking quite a few wethers to the abattoir. This year I have had two new customers, one local and one definitely not. The local one is just over the hills into Nidderdale and is called the Yorke Arms. I am very proud to be supplying them with mutton because they have a Michelin Star and so produce seriously quality food! Delivering here entails a drive across the moors, but the views are so stunning i don’t mind that at all. It does seem strange sometimes to think of Londoners wandering into a cafe there and eating mutton raised on the slopes of Penhill, but i suppose people eat New Zealand lamb so it should not be that strange. That is all for now, but i will try and post more often this year! I must be a glutton for punishment, because not only is it the time of year when the Mutton carcasses start to become available (lots of news on that front for a later date!) but the start of Tupping is only about 3 weeks away so the ewes need to be flushed to get them in the best shape. On top of all of this, i am continuing to run Sheep Handling courses. What are these courses i hear you shout? Of course you do! Well, i have been running these sheep for ten years now and have had to learn everything from scratch. And in my main job, i spend a lot of time teaching scientists. So why not combine the sheep with the training element? These courses (http://www.swaledalemutton.com/sheepkeeping.html) are a full day, covering fields and fences, equipment, regulations and paperwork, sheep health, lambing and indeed just about anything you might need to know if you want to keep sheep, or even if you just want to find out about our wooly friends that provide such great meat! The courses are run in quite an informal way, and prior trainees have said what a good day they had, and it also includes lunch at Berry’s Farm Shop! At this busy time of year i will probably only have chance to run one course a month, and will add dates to the webpage regularly. But, if you wanted to find out more, just get in contact and ask away! It is almost that time of year again. I have brought the first five wethers down from the moor to fatten up a little before slaughter, but in a couple of weeks time, the first animals will go to the abattoir and a week after that, it will be delivered to my customers and start appearing on dinner tables and menus. It is a fairly exciting time, but also somewhat daunting (a bit like approaching lambing time really). It is when most of the money comes in from the sheep, but there is also a lot more work to be done, feed to be bought and so forth. There is also the phone calls/visits to head chefs, emails to private customers and so forth to find out how many animals i will need. Then arranging their killing and butchery. Then changing everything when someone changes their mind. But, the end product of all of this is fantastic mutton. I had some friends over for the weekend, and so my wife prepared a mutton hot pot in the slow cooker with black puddiing, onion, carrot and potato. It took nine hours to cook, but I think i personally ate about 4 or 5 servings of it, and had trouble moving far or fast that evening! And, more than the money, it is the feedback from chefs and customers about how good the meat was that keeps me going when things get difficult! 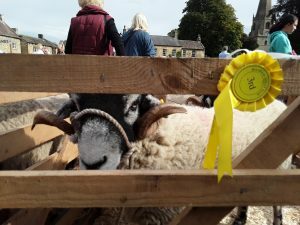 The Masham Sheep Fair was yesterday, and it turned out to be a really good day! As it happened, they both behaved themselves almost perfectly. One did decide to take advantage of my turned back and give me a bit or a prod with his horns, but that was that. There was a minor bit of showing off to the nice looking ewes in the next pen, but what else can you expect from what are essentially hormonal teenagers! The judging itself was not as successful as last year, with my two coming Second and Third, but my daughter managed to show one of them herself with no problems! Possibly slightly disappointed (you always want to win) but that was not the main reason for going. The main reason was to talk to people! As anyone who knows me will tell you, i like to talk about things i like, and this was the perfect opportunity. There were lots and lots of people there, and many of them admired Swinithwaite Bertrum and [Name to be decided]; their horns, their fleeces, their cute faces. People were interested in the sheep themselves, my mutton, where i kept them and just about everything sheep related. Some of the visitors were knowledgeable, and some knew nothing at all about sheep, but either way Florence and myself had a great day just talking to people. And you can’t get better than that! Author AdministratorPosted on September 25, 2016 Leave a comment on Masham Sheep Fair 2016! The Masham Sheep Fair is just over a week away, and i have entered both shearling tups into the judging there. 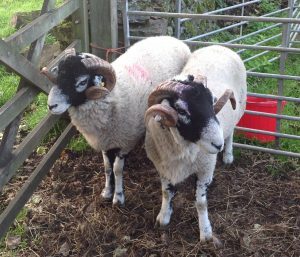 With Swaledales, that means making them look smart by plucking out any white hairs in the black part of their face. 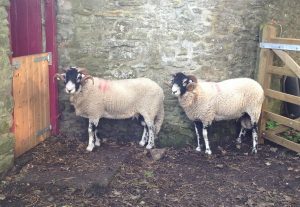 Still, they are a good looking couple of tups, and hopefully they will do well at the show and the Tup sale in October! 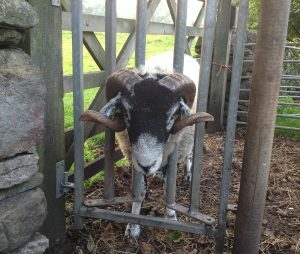 Author AdministratorPosted on September 16, 2016 Leave a comment on Masham Sheep Fair awaits! My first sheep have arrived. Admittedly there are only 10 ewes and a tup, but they are a start. There is a long way to go, but these are my first steps of a massive career change, away from the comforts of a guaranteed monthly income and towards being a farmer. Having spent many years both studying and working at universities, my current career of Cancer research scientist has recently been losing its appeal. The insecurity of the research grant system meant that you can only plan your life in 2-3 year blocks. Not particularly appealing when you have a wife and a young daughter. So after much thought, I took the decision to follow a long-held dream and become a sheep farmer. I suppose that the current state of the farming industry does not really recommend it as a career with major prospects, but I hope that with a fresh approach and lots of hard work, it should work for us. I started laying the ground work some time ago, helping a local sheep farmer with lambing, shearing and all of the other (frequently messy) tasks that are so necessary. I began reading all of the DEFRA publications, and trying to untangle the Byzantine regulations. I contacted every organization with sheep, organic or farming in their title, and many more besides. I stacked hay bales and pulled ragwort. In short, I tried to expose myself to as much of the farming necessities as possible. I also slightly changed my university job to allow a three-day week, giving myself that extra farming time while guaranteeing an income. However, without a farm, none of this will make any difference. I looked into buying, and hurriedly concluded that I had no chance. Unless you have quarter of a million pounds to spare for a deposit and a long farming background, you cannot get an agricultural mortgage. So renting became the only option, though not necessarily a worse one. Thus began a constant round of phone calls to land agents, the National Trust, the big estates etc. The anticipation of the next issue of Farmers Guardian with the “To be let” section of the classifieds, and the disappointment of nothing available. The occasional visit to a possible farm to find that there is no house, or no buildings, or only a few acres of grazing. It does seem that on many of the big estates, the houses make more money as residential lets with the land going to local farmers. It also raises questions about how hard you push. Too much and you will end up annoying the people whose goodwill you require, not hard enough and you may lose that prized tender. It is also obvious that my lack of agricultural background will count against me when it comes to the consideration of tenders. I feel I have done all of the right things: spoken to potential markets about sales, spoken to the DEFRA “Fresh Start” initiative people (and their local representatives), spoken to land agents about preparing tenders, spoken to the Tenant Farmers Association. All of these have been very helpful, but at the end of the day, it all comes down to whether you are given an opportunity to prove yourself or not. And that brings me to the present. We had heard on a local grapevine about a farm coming available, and we have been in constant touch with the agents for months. We should hopefully hear in the next few weeks whether it will become available or not. If it does, we will just have to hope our tender is successful. If not, then it will be back to the FG classifieds, the regular phonecalls and the frustration. Still, I have my 11 sheep, which is a start…..